There are a lot of reasons why you may need dedicated wireless headphones for TV. A common example may be those nights you’ll have to binge-watch your favorite movies or shows without waking up the whole household as the late night actions unfold. There are various headphones in the market with varying performance and qualities. 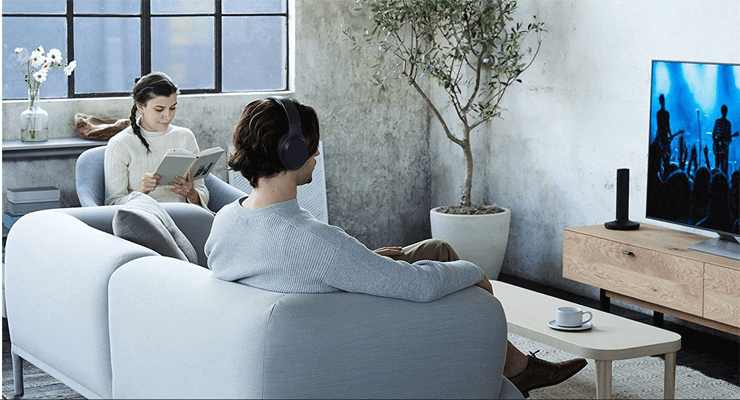 To save you the rigors of having to go through several wireless headphones for TV reviews, we bring to you an unadulterated list and guide to the best wireless headphones for watching TV. There are two different patterns through which you may want to connect any of the best wireless headphones for watching TV to your television system. The TV headphones themselves come in two units that consist of the headphone itself and the base unit. The base unit connects directly with the TV, serves as the docking stations and charging set in rechargeable headphones. The base unit is the part that transmits audio wirelessly to the headphone and this, depending on your TV’s part may be through the analog audio output or the coaxial audio output. If you already have a Bluetooth-compatible headset and would like to connect such directly to your PC, it is actually possible although Bluetooth connections are prone to audio lag or lip sync delay. RF headphones, on the other hand, may suffer from little noise interference from the transmission but is devoid of lip sync delay or lag common in Bluetooth-connected wireless headphones directly connected to the TV. A dedicated wireless headphone for TV comes with some benefits. To ensure these benefits are gotten with as little as possible constraints, it’s then important to have a few things in mind when shopping for the headphone to complement your home’s entertainment system. This is the first thing you should consider. How much do you have to spare or spend on your choice of headphone? A tight budget will do better with either of the Power Acoustik Headphone Fahrenheit HP-902 or the Sony MDRRF985RK Wireless RF or the Avantree all promising decent to excellent output. If money is not a problem though, the Plantronics model and the Sennheiser RS 185 RF provides better sound quality. You’d want something that should be comfortable even after wearing those for long hours. Headphones with wide earcups and padded headbands are great for comfort and convenience. The Sennheiser 185 is rated as one of the most comfortable wireless headphones for TV or movie sessions. Of course, you won’t want something that will drain too often. A headset with at least 20 hours of battery life is good and all of the best wireless headphones on our list more than meet this requirement except for the Headphone Fahrenheit HP-902 RFT which uses AAA batteries. You’d also want to invest in something durable. Be sure your set is not one that will break easily and wear off in the face of tough or extended use. Would you need an open-back or closed-back headphone? Both of these come with their pros and cons as far as sound leakage and sound quality is concerned and it is in your hand to finally decide what you’ll eventually go for. While many of the headphones on our list come with highly sophisticated features and a somewhat steep price, the Power Acoustik provides double value with decent qualities at an incredible price. The Power Acoustik comes in on our list, not for its overwhelming sound quality but for its modest pricing and value. The Power Acoustik comes with a transmitter and two headphones for another user to also catch the fun. This Sony model is also another affordable option with slightly better qualities than the Power Acoustik above. The headphone uses RF connectivity and rocks a chintzy look with its plastic construction. The headphone has very wide earcups and is a great alternative to users who may be uncomfortable with other headphones in its category such as Sennheiser RS 120. The Sennheiser RS 185 RF is unarguably the best wireless headphone for watching TV. It comes at a price though and offers a quality level of sound that you’ll hardly find in other model or brands of headphones. The headphone has got some pretty great sound along with great features to match. The open-backed RF headphone might be a little too loud if you’d be watching with someone sleeping right next to you though. The Sennheiser RS 165 RF may be an alternative in this case. Although both models may seem a little bit pricey, hardly would you get this sound quality from most other headphones on the market. Avantree comes in as an unlikely name in our list of the best wireless headphones for watching TV. The headphone is highly affordable and comes with the aptX Low-latency codec and a battery life of about 40 hours. The range though is a short 10 meter and so the Avantree works best in bedrooms or other small areas. You may also decide to grab a transmitter to unlock the potentials of the Audition Pro while still operating within a reasonable budget limit. The headphone can be used with your mobile phone and retails for far less than a $100. The Plantronics Pro 2 SE delivers high-quality sound and is definitely one of the best wireless headphones for watching TV available on the market today. While the pricing may also seem to be on the high end, this Plantronics offers a great sound quality to match and the excellent Active Noise Cancellation (ANC) feature will help cancel out ambient noise when you have to use your headphone in a noisy environment. The headphone has some mouth-watering features some of which we’ll discuss below. The five awesome headphones above happen to be the best wireless headphones for watching TV. The Power Acoustik Model, the Sony MDRRF985RK as well as the Avantree are valuable, budget-friendly headphones with decent to excellent sound quality. The Sennheiser RS 185 RF though is our top pick and the Plantronics PRO 2 SE likewise provides great sound quality. Regardless of your choice, these headphones will still give you decent to excellent sound output and they are clearly the top of the pack. When you are in need of the best wireless headphones for watching TV, it is advisable you go for the best available to avoid series of problems that could range from poor sound quality to discomfort and inconvenience in the long run. These headphones will save you the troubles of disturbing others and will help to launch you right into the action giving you a whole new experience. Make your own investment in a quality headphone today and you’ll have yourself to thank as you begin to enjoy trouble-free, excellent cinematic television experience.